"Nest parasitism or brood parasitism" is a phenomenon in which a bird raids another bird's nest, destroys its eggs and lays its own eggs in the nest. The cuckoo is an 'interspecific' nest parasite. It usually lays its eggs in the nests of babblers and crows. 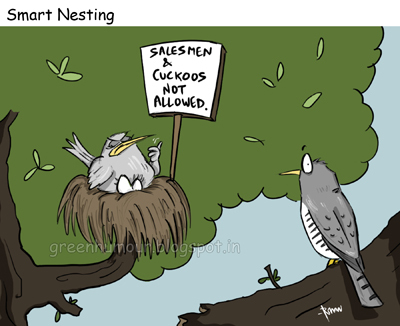 the 'host' species, i.e whose nests have been raided, incubate the cuckoo egg and the raise the cuckoo chick as their own, acting as foster parents to the cuckoo offspring. Brood parasitism is also seen in various insects, fish, reptiles and other birds such as some species of duck, cowbirds and honeyguides. Dude make the bolg archive column wider. why dont you design a website for your blog. I think I have not seen so many of your cartoons and there is noway to know it coz the blog archive column in unreadable when expanded.